DemoCurmudgeon: The "Wall" distracts from debate over Future Job Losses via Robotics and AI. The "Wall" distracts from debate over Future Job Losses via Robotics and AI. While our poor excuse for a president keeps our national attention on "the wall," we're allowing ourselves to be purposely distracted from the real job of governing, planning for the future. I'm going through a mild panic thinking about the Robin Vos/Scott Fitzgerald threat to protect, at all cost, policies they put in place over the last 8 years. Having already neutralized Gov. Evers and AG Josh Kaul's biggest campaign promises, Republicans are promising to maintain their biggest failures while ignoring America's future. I've written about the need to take seriously the idea of a "basic income," knowing robotics and changing consumer norms will no doubt turn the marketplace upside down. We now have research that bears this out. Strikingly, none of this is on the GOP's radar, and to be honest, just barely on the Democratic agenda. Rural Jobs Most Affected: The party least interested in change will negatively impact their rural voting base in a big way, and they won't even know it. 1. 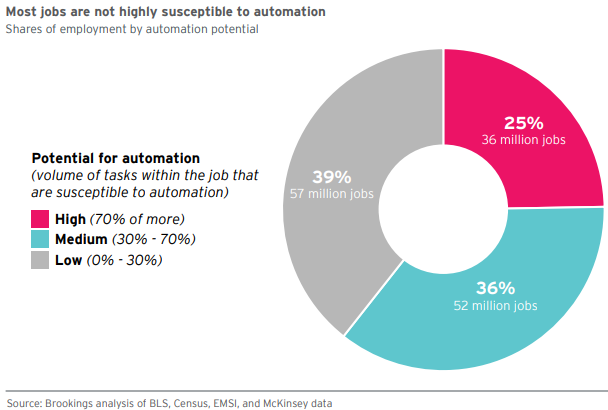 25 percent of US employment will face what the report authors called "high exposure" to automation in the next few decades. That translates into about 36 million jobs. 2. Another 36 percent (52 million) will face medium exposure. 3. Rural communities are more vulnerable. There are demographic implications, as well. Hispanic and black workers are also have greater exposure. 4. Among the most vulnerable “high risk" jobs are those in office administration, production, transportation, and food preparation ... with over 70 percent of their tasks potentially automatable, even though they represent only one-quarter of all jobs ... occupations requiring a bachelor’s degree runs to just 24 percent, less than half the 55 percent. 5. 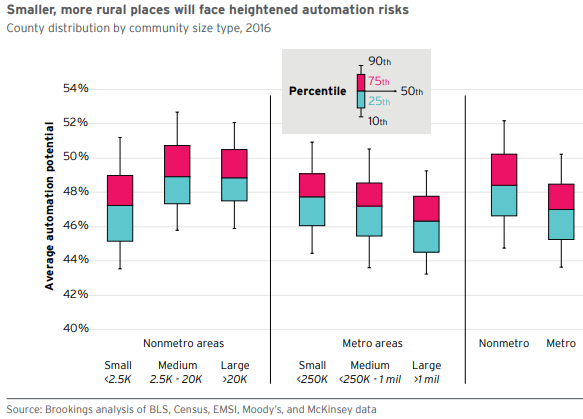 At the community level smaller, more rural communities significantly more exposed to automation-driven task replacement— and smaller metros more vulnerable than larger ones. The average worker in a small metro area with a population of less than 250,000, for example, works in a job where 48 percent of current tasks are potentially automatable. 6. Male workers appear noticeably more vulnerable to potential future automation than women do, given their overrepresentation in production, transportation, and construction-installation occupations—job areas that have aboveaverage projected automation exposure. 7. By contrast, women comprise upward of 70 percent of the labor force in relatively safe occupations, such as health care, personal services, and education occupations. 8. The young facing the most disruption ... between the ages of 16 and 24 face a high average automation exposure of 49 percent, which reflects their dramatic overrepresentation in automatable jobs associated with food preparation and serving. I just discovered this graphic heavy presentation of this research, HERE. Here are a few sources I've been meaning to sort through, that will give you some idea just how complex and important these future economic issues are: Paying for Infrastructure, 4 Wiser Ways for Infrastructure Investments, A Distributed Government, Politicians cause Pay Collapse.